World On Alert: Has The American Ebola Outbreak Spread To Africa? The nightmare scenario may have just gotten worse. Following weeks in which the disease seemed to be confined to the United States, sources are now reporting that the American Ebola epidemic has spread to Africa. Ebola, a deadly virus that causes painful internal and external bleeding, has ravaged the U.S. since late September. But for West African countries, the horrors may just be beginning. Is it time for Africans to start worrying about a full-scale outbreak? 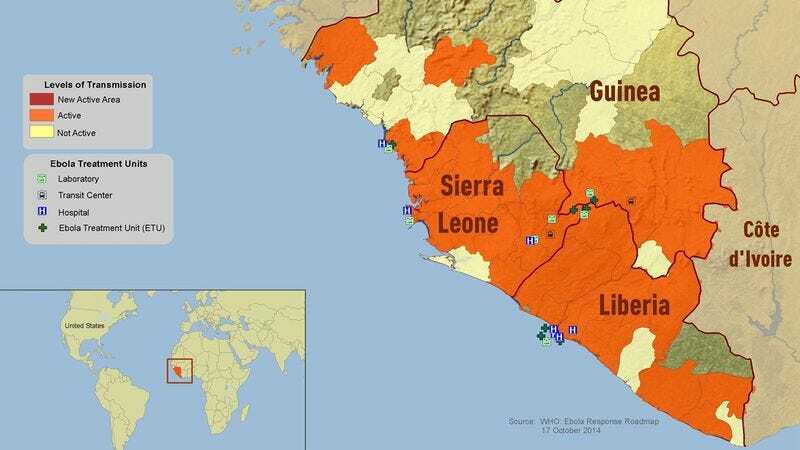 The World Health Organization has reported dozens of suspected (and at least two confirmed) cases of Ebola throughout West Africa, and has warned that many hospitals in the region lack proper quarantine protocols and are ill-prepared to check the advance of the disease. In countries like Sierra Leone, Liberia, and Guinea, the Ebola virus is suddenly more than a faraway North American problem. The menace has arrived on African soil, and unless appropriate action is taken, the continent risks suffering a tragedy on the same scale as what has already been reported in the United States. For now, all African citizens can do is stay calm and remember that at least for now, the threat of Ebola is truly incomparable to anything happening in America.